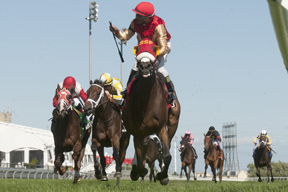 Smartyfly repelled the challenge of Spring in the Air to score a three-length win in Sunday’s $250,000 Wonder Where Stakes, at Woodbine. Contested at 1 1/-4 miles over the E.P. Turf Course, the Wonder Where is the third leg of the Canadian Triple Tiara series for Canadian-foaled three-year-old fillies. A Sam-Son Farms homebred daughter of Smart Strike, the Malcolm Pierce trainee demonstrated remarkable resiliency to fend off a game and determined Spring in the Air through splits of :25.90, :50 and 1:14.07 as the duo raced one-two throughout. Surtsey, an upset winner of the Ontario Damsel last time out, was urged into contention for the stretch run but there was no catching Smartyfly, expertly ridden by Eurico Rosa da Silva, who stopped the clock in 2:03.27. Spring in the Air held on for place, a neck in front of Surtsey. The race was marred by the unfortunate breakdown of Woodbine Oaks winner Nipissing entering the far turn. The Chiefswood Stable homebred daughter of Niigon was vanned off and later euthanized. Pierce was understandably humble in victory. It was Pierce who called for Smartyfly, not normally a pacesetter, to be more prominently placed in the Wonder Where. “We were sitting in the one-hole and the more I looked at the race, I couldn’t find anybody that was going to be on the lead,” said Pierce. Smartyfly banked $150,000 in victory, while improving her record to 2-3-1 from eight career starts. She returned $13.40, $5.30 and $3.80, pairing with Spring in the Air ($2.80, $2.40) for a $40.40 (1-2) exactor. A 1-2-5 (Surtsey, $3.30 to show) triactor was worth $175.70. As If I Care completed a $1 Superfecta (1-2-5-6) worth $892.60.